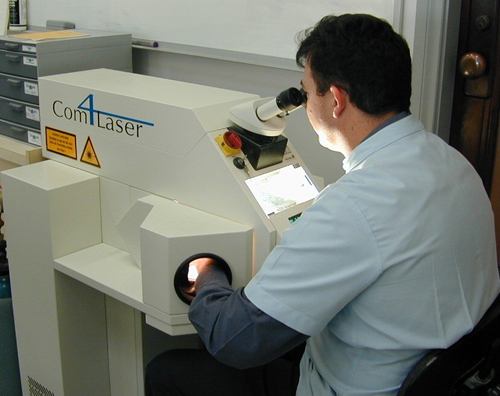 Laser has completely revolutionised the eyewear restoration industry. Previously, technicians used silver soldering to fix glasses – laser welding is considered to be almost 300 times stronger than this. It has enabled our technicians to tackle the most intricate of jobs, where previously repairing wouldn’t have been an option. Our laser welding unit produces a microscopic light beam of incredible energy to precisely weld broken surfaces of metal surfaces back together again, without damaging the surrounding area. Our gallery of work contains samples of glasses repairs that demonstrate some of the amazing results we have been able to achieve using Precision Laser Welding. We also use laser to repair and refurbish watches. Most metals can be laser welded so, whether your watch is gold or silver, if it’s damaged we can refurbish it using this technology. For examples of how effective laser welding is in watch refurbishment, see our restoration of Tag Heuer Grand Carrera.